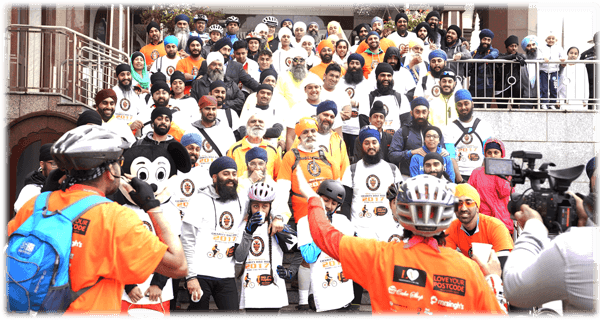 With the blessings of the almighty Guru, the Sikh Helpline successfully completed it’s 4th Annual Charity Bike Ride. With almost 100 riders, the event was a great success, filled with uplifting team spirit and atmosphere amongst members of the community motivated to raise funds to support this great cause. One of the riders, Suki Lotay described the day as a “great atmosphere and vibe - the experience was fab riding with so many fellow Sikhs. The reaction from the public was great and they wanted to know more about the Sikh bike ride”. The cyclists set off on their 24 mile bike ride, sponsored by 28 local businesses and West Midlands Police, to show their support of the work that is carried out by the helpline and to raise awareness of the services the free community support that the charity provides. 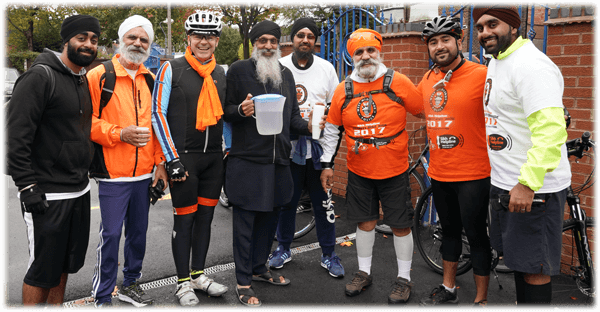 Along the route, cyclists were greeted at each of the 11 gurdwaras with free food and drink (langar) as well as amazing Kirtan (hymns) to show support to both the Sikh Helpline and the riders. 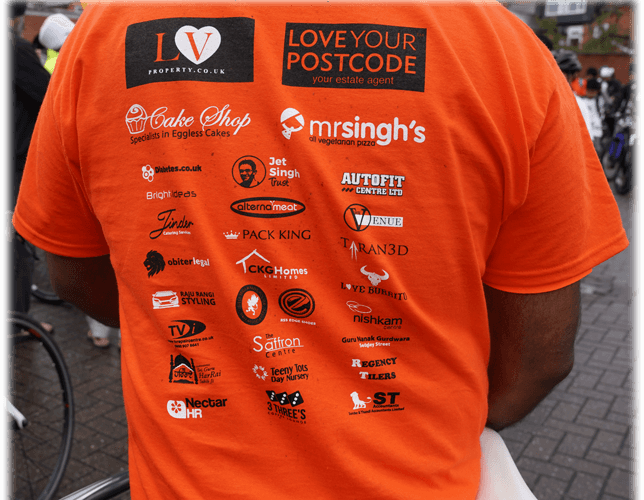 Mr Singhs Pizza, a long standing supporter of the helpline thanked “the riders and everybody who donated for this brilliant cause where a lot of voluntary service is involved and every penny spent goes to a good and necessary use”. The pizza chain, also provided free refreshments and hot pizza as the cyclists pedaled past their branches in Handsworth and Wolverhampton. The Sikh Helpline has built connections with a number of agencies to ensure callers are signposted to receive the right help. 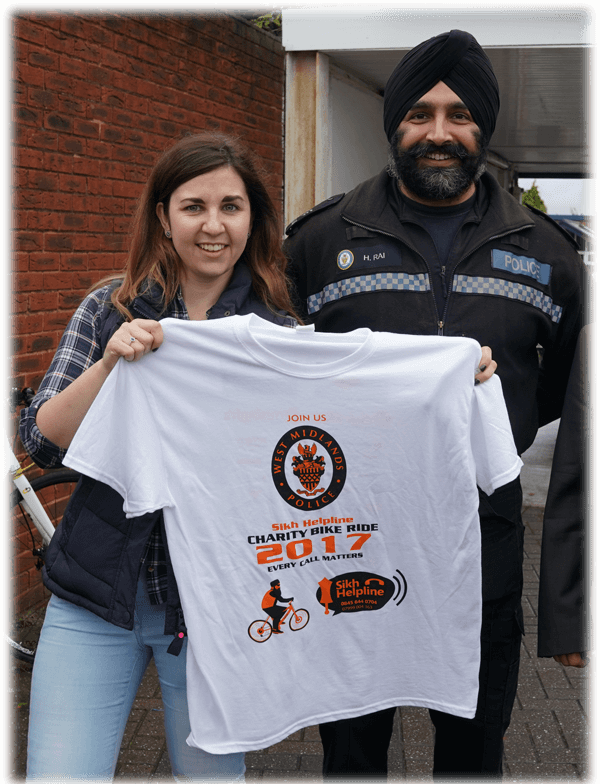 Many took part in the bike ride to show their support including West Midlands Police, this year’s main sponsor for this year’s bike ride. Chief Constable, Dave Thompson expressed “we are happy to engage with organisations, such as the Sikh Helpline which make the health and wellbeing of our communities better. I am pleased we can support the good work they do”. The Sikh Helpline and the West Midlands Police Public Protection unit have forged an effective working relationship in order to help those callers in need. 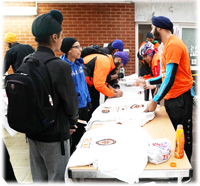 Last year’s main sponsor Jet Singh Trust continued to support the event this year recognising The Sikh Helpline as “an invaluable service not only for the Sikh Community but whoever needs their assistance. Without this service thousands of people would have nowhere to turn to and would face unimaginable pain and suffering”. The Sikh Helpline continues to receive a high volume of nationwide calls. High call rates are seen from victims of abuse, domestic violence and more recently an increase in call relating to suicide of young member of the community. Due to cultural taboo, many families choose to stay silent and remain reluctant to speak out and get help before it is too late. Giani Sukha Singh (CEO of The Sikh Helpline) said that “any cheque or donation is not just for the Sikh Helpline, it’s going to help for example that one lady who silently suffered domestic abuse for 21 years, until she saw a Sikh Helpline poster and made that one call for help, crying out she couldn’t take it anymore”. The annual bike ride event is an opportunity to raise awareness of the valuable services provided as well as to raise financial support required to fund our calls and staffing. We need the support of the local communities to help us keep up with the increasing demand of calls. Every call matters and a missed call may be the only attempt someone makes for help. It is crucial that every call is answered.